I burned two ecus up trying to get this project finished. Bought a third and changed some things and got it communicating with the laptop. The little books I got with each ECU say my nap and map need to matched. I bought a house clock that has a barometric on it. Currently it's reading 29.92 hg and on this chart I found it translates to 101.3 kp. I can't seem to adjust the map up to that number, I can get the baro up there but the map always jumps back to 89? I've deleted a bunch of in necessary wire harness and can't believe this could cause problems. I deleted the unused wires to the electric start plug, the wires that went to the hood harness, and some to the speedometer I don't need or have a place for. 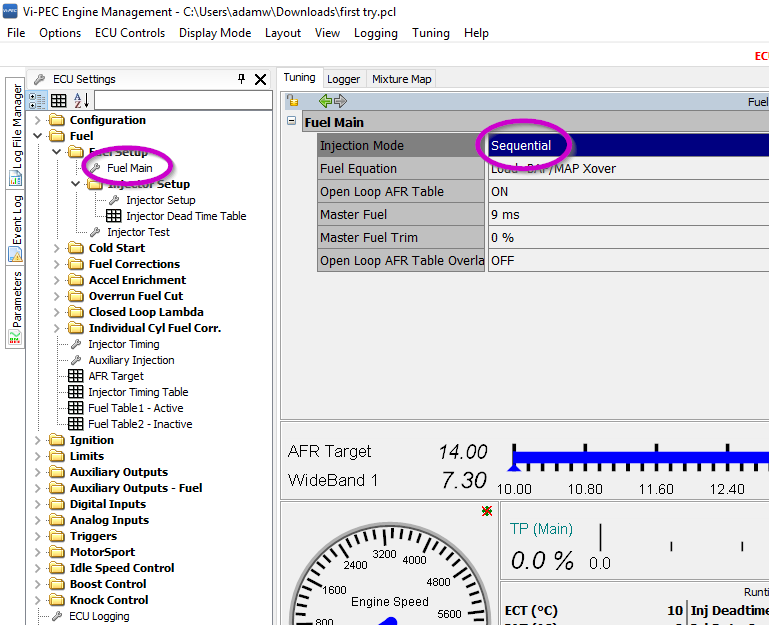 In the programming I found the tab to shut off the "speed"
This ECU was used from a slightly different turbo kit. His had larger single injectors, where I have the stock and secondary injectors. I figured out how to test all of them. The stock ones clicked right off. The secondarys I turned on the auxillary Injection thing then down lower in the side bar there is another two tabs for each extra Injector. Clicking these gives another drop down menu where I tried to select "injection" but it just kicks out, scrolling down I then tried "ic spray". This got them to click under the test function when I applied external power to them. Can you give us a bit more info. I'm assuming this is an Arctic Cat, but is it the 800 or 1100? Post your map and log file here once you've done that. its a 2011 Polaris pro rmk 800.
that's another question I have, logging. I have a switch wired into this and when flipped the light turns on and a bar highlights on the laptop screen saying its activated but where does this information go? I tried this a few times and don't see any recorded info? great video I think I learnd something there! too bad im at work for four days! Not sure if either of those work? I can't tell a difference between my live screen and the recorded one? 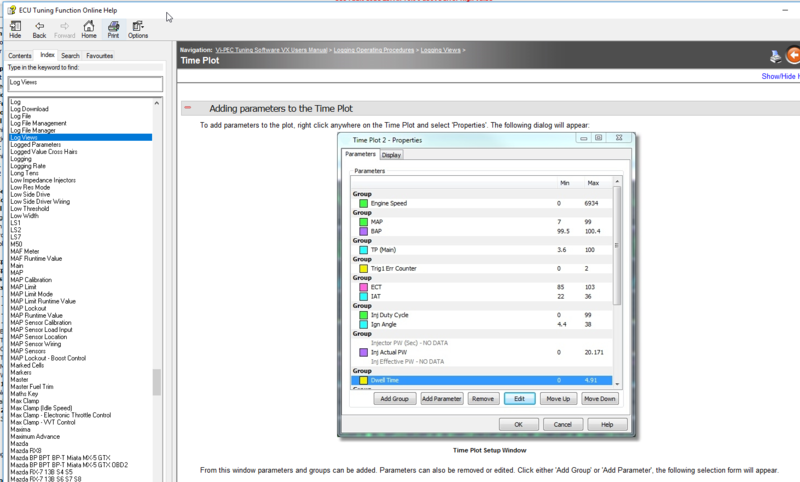 To enable your secondary injectors you need to change injection mode from sequential to "sequential/staged". 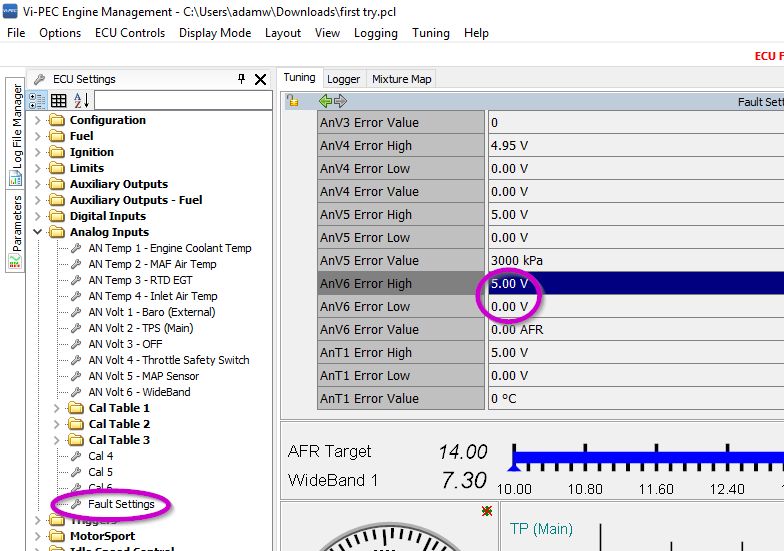 There is only 1 fault code showing in the log and that is for the wideband sensor on ANV6. You can change the fault settings to my settings below to get rid of that. Thanks my links must work! Great! So your saying even though I have three codes on the upper header in red they don't really mean anything? 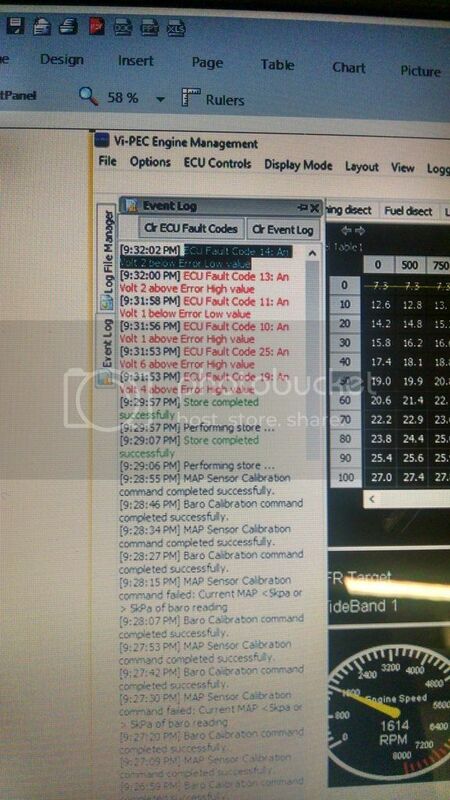 There were no other active fault codes in your log. If you still have some please list them here or take a screenshot and I will take a look. Every time I get on my ecu ive been starting over for fear I might save something and not be able to get it back. Well that and I'm not sure how to save it? And if I wanted to revert it back after I make a bunch of changes I may have lost track of? 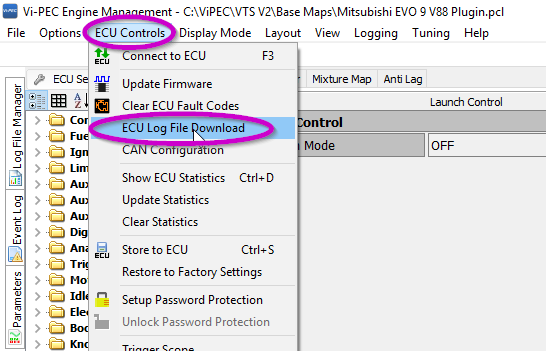 how do I record a pc log vs a ecu log? here are some more pics and a log of it idleing and just off idle. the cal 4 table was great help thanks, the numbers on the pc differ from the gauge about one digit though? Note, most of your questions will be answered by reading the help file. All this is well covered. Earlier you said your wide band calibration was 0.5V = 8AFR. 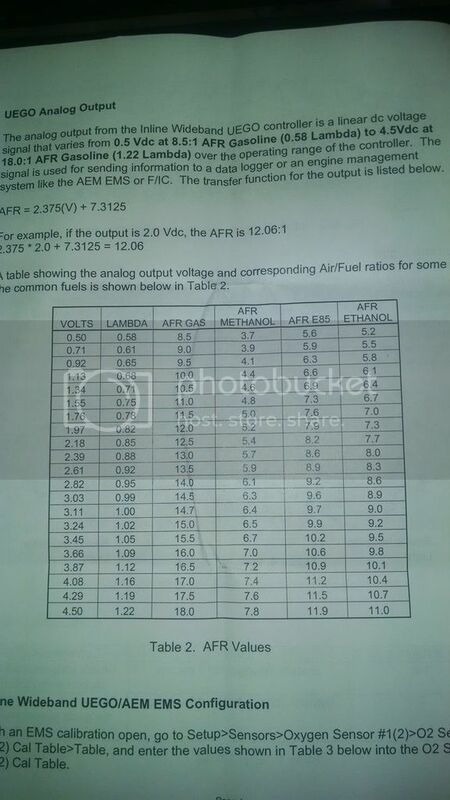 That data sheet shows 0.5V = 8.5AFR. The log suggests you might have a wiring problem, Im not sure but this may be causing the analog fault codes. 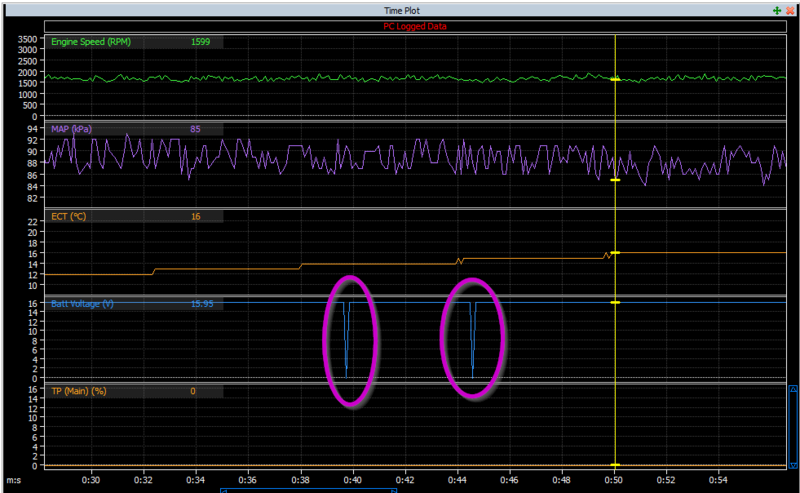 See below the battery voltage has little dropouts down to zero, that suggests a bad connection somewhere. Also I see you are one older firmware. You should update to the latest firmware. (read the help file to learn how to do this). my exhaust valve solenoid is making a loud clicking noise I guess my short could be in it. I tested it with my multimeter and it has the correct ohms. data sheet, yes, I was just guessing in that first post but thanks to your help I got the correct numbers in that chart but the readouts differ by about one digit still. the voltage dropping to zero is hard to figure? I had a battery hooked into the system while running. unless its a short? and that solenoid was making totally random noises. I wonder if I unplug it and try running again just to see if it drops? Fiddling with the faults and noticed one is an volt 2, it looks like it's the throttle safety switch. I turned that function off but still get the fault? There is a "problem" with it. I don't have a switch like stock, and think I soldered in a resistor to make the stock ECU think it was still there? I have an aftermarket throttle block to relocate my kill switch. I wouldn't think it would be necessary to have it for the vipec? I suppose I can just delete all those wires too. 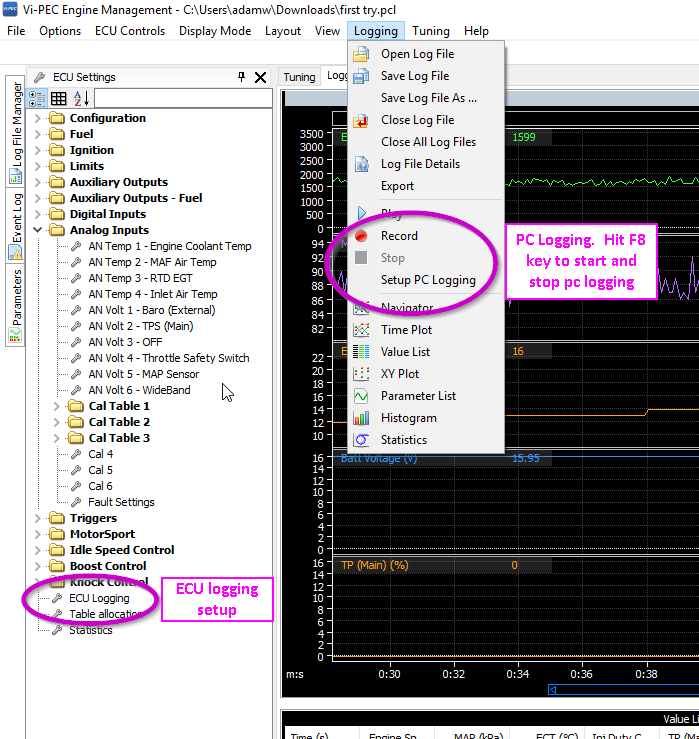 How do you switch between the different parameters in the log? I was trying to test my exhaust valve theroy but can't figure out how to view the voltage like you did? With it off I can now work my baro and map up to 99 where as before they would only get up to 93. And the way of adjusting them is way different now. Before I would enter values of anywhere from 14-18 in the baro box to get it up to 93 but now the values entered are closer to the result. Example, a value of 102.4 entered into the baro box equaled 101 like I need. But the map won't follow it that high. 99 is all it'll rise to. The spikes are 5 seconds apart. I didnt even know that you could calibrate the baro on these so I cant help much in that respect. How sure are you that your MAP is actually a GM 3 bar? I am positive I have the gm 3 bar. its brand new and matches the other three I have that came with the three vipecs. they all read the same on the screen. in the paperback manual that came with these, it reads the baro and map should read within one digit of each other. like you reminded me that's just at idle. however after its shut off the map dosnt return back up where it should. I have a feeling theres still something funny with my black blue sensor ground wire. weather it be a bad sensor somewhere or something backwards since all the faults have to do with just that system, well except for the afr code which makes no sense. on a positive note, I guess I didn't burn up the other ecus. I have something wrong with the 26 pin connector? has anyone heard of those pins wearing out? well I guess it could be the female end too? probably the most obvious being none of the three work right on this harness but do work on the harness on the bench. I came out to find the newest one faulting just like the other two but when I picked it up this time it was powerd up and flickered when I moved it? now hooked up to the second ecu and fiddling around I found it to be one of the wires from around 14-17 I believe but cant get it localized just by pushing on them? any ideas? heres a little log of when I push on them and release, I can release slowly and make it creep or just let go and it jumps. How do I contact vipec? Emails just get sent back to me? Are they even still in business? Vi-pec was a Link brand that we discontinued some years ago. The website remains mostly as resource of archived documentation. I didn't know the email was bouncing though so I will see if that can be fixed. I didn't know you were part of the tech support I assumed you were just a helpful observer haha well my question is who has snow specific info for me? Like a list of dealer's I could call? Question, can this ECU run without the factory gauge? It has to, I wouldn't think race teams would be forced to have the extra weight of the harness, gauge and connectors all bunched up on board? Maby there is a specific harness or mod to a stock one I'm missing. 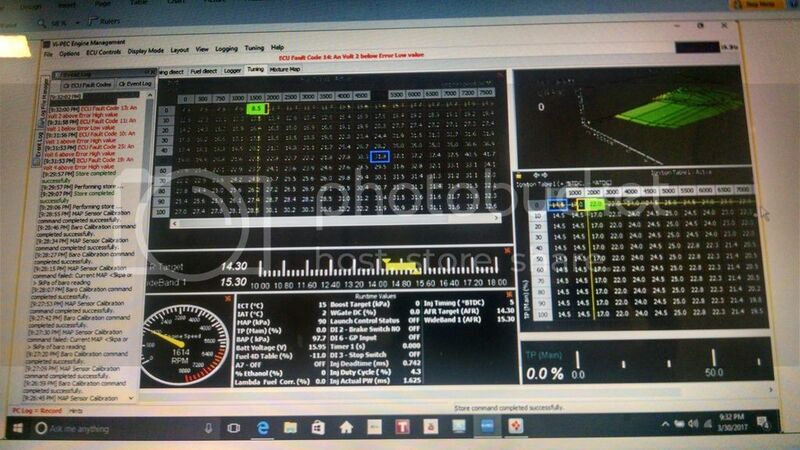 As far as I can see the ECU has no need for the factory instrument cluster. We only send data out to it and dont receive any info from it. I dont know if there are any other systems on the sled that need the dash however, I can only help from the ECU perspective. Right right, I'm not sure who these ecus came from originally however two of them have never really ran. As in the owners couldn't figure out how to use them.